This is so pretty and vibrant! Like the other recent one you made, the yellow really pops on this! Nicely done. 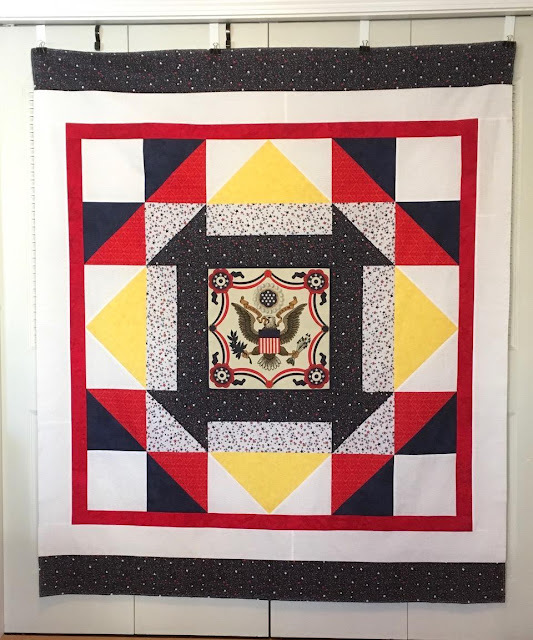 The yellow really makes that quilt pop! Another simple but striking layout. Those napkins are sure turning out to be a great purchase. And I noticed it's #133. Wow! Your pieces line up so perfectly!! Good name for a nice, bright quilt. That was fast!!!! I love how those colors work together with that center area that is just perfection. WOW! I love that pop of yellow! It really makes that entire quilt. Very nice - so sharp and clear. I like the way you have added the yellow, it really adds some pizzazz to the finish. Always impressive Nancy. The Napkins as the center piece are just awesome. I love the descriptive name, and the use of the napkin as a centerpiece for the quilt. The pops of yellow are just what this quilt needed-superb work! I like that name! We missed on viewing the blood moon, too cloudy here.